This item is a Paper in the Social Networks and Web 2.0 track. Web 2.0 applications like Flickr, YouTube, or Del.icio.us are increasingly popular online communities for creating, editing and sharing content. 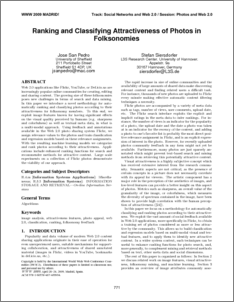 The growing size of these folksonomies poses new challenges in terms of search and data mining. 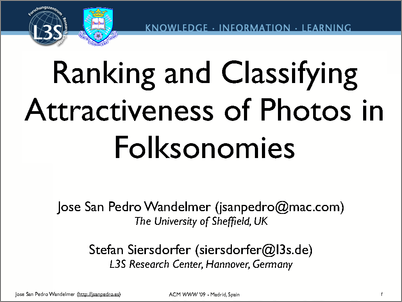 In this paper we introduce a novel methodology for automatically ranking and classifying photos according to their attractiveness for folksonomy members. To this end, we exploit image features known for having signiﬁcant effects on the visual quality perceived by humans (e.g. sharpness and colorfulness) as well as textual meta data, in what is a multi-modal approach. Using feedback and annotations available in the Web 2.0 photo sharing system Flickr, we assign relevance values to the photos and train classiﬁcation and regression models based on these relevance assignments. With the resulting machine learning models we categorize and rank photos according to their attractiveness. Applications include enhanced ranking functions for search and recommender methods for attractive content. Large scale experiments on a collection of Flickr photos demonstrate the viability of our approach.